Taken Saturday, October 17th, 2015 from 11:47AM-12:37PM. Found and © by Mike Ritter. This is the first day of the 50th Head of the Charles Regatta which is the second largest 2-day regatta in the world. 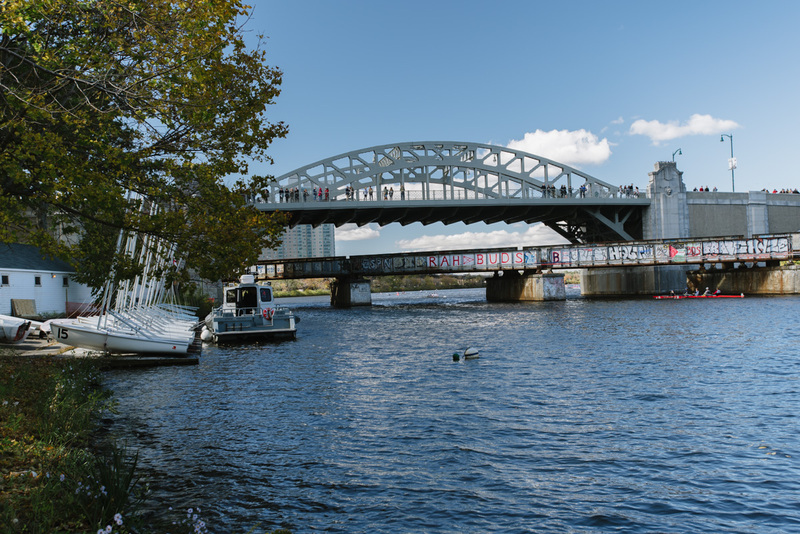 The starting line is just to the right out of frame and the BU Bridge is the first of six bridges for teams to pass under over the three mile course. 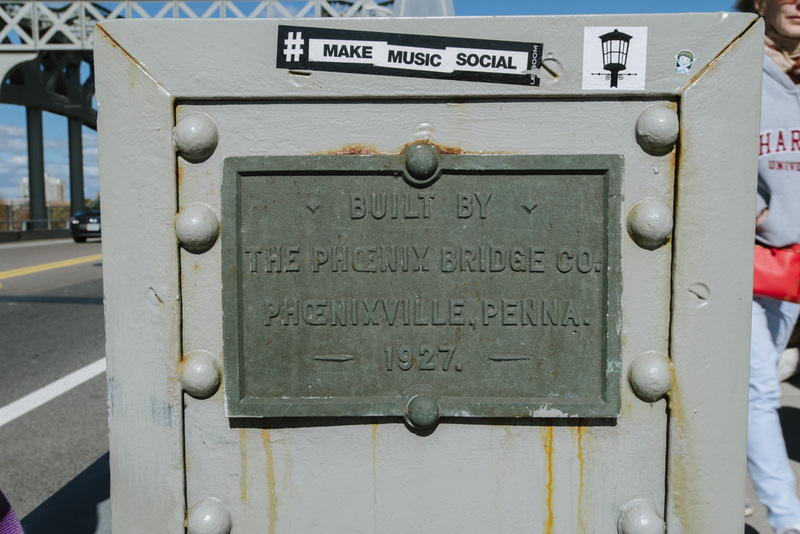 The Phoenix Bridge Company, a subsidiary of Phoenix Iron Works, built the bridge. Over the years, various branches of the Phoenix Iron Works produced cannons for the Union in the Civil War, sent puddled iron to France to construct the Eiffel Tower, and invented the Phoenix column making the creation of skyscrapers possible. Over its existence, the Phoenix Bridge Company built roughly 4,200 bridges, one of which was the disastrous Quebec Bridge which collapsed twice in 1907 and 1916 before finally being completed in 1919. A plane flies a car dealers banner in the middle of the frame. This is one of the three places on earth where simultaneously a plane can fly over a car going over a train going over a boat. 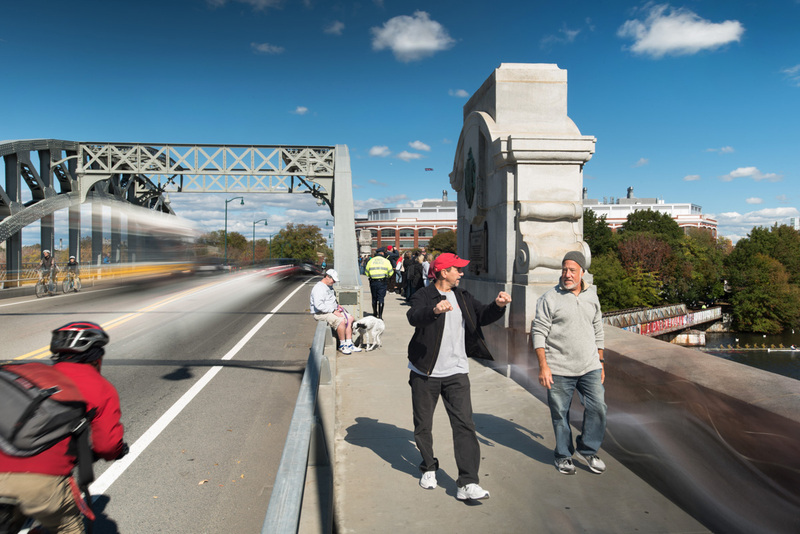 It was the only place in the world where spectators could climb down onto the piers of the railroad bridge, in this case the Junction Railroad Bridge, to have planes, cars, and trains pass overhead while world class rowers passed beneath. A policeman now patrols the bridge making sure none of the expected 300,000 spectators can have this singular experience anymore. Happily, years ago before this was discouraged, I was able to hear the swoosh of Championship Eight boats flying by under the bridge.